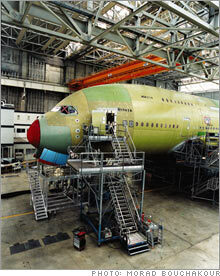 The largest passenger plane ever built, the Airbus A380, has been a a $6 billion headache for its European manufacturer. Now the company is scrambling to keep customers onboard. Fortune's Nelson D. Schwartz reports. (Fortune Magazine) -- Sometime in late March a giant will make its first appearance in the skies over the U.S. The Airbus A380, the largest passenger plane ever built, will touch down at John F. Kennedy International Airport in New York City before heading to Chicago's O'Hare. While plane spotters and other aviation enthusiasts eagerly await their first sighting of the 239-foot-long monster, another group will be watching even more closely - long-suffering A380 customers who have endured one delay after another and are now wrestling with whether to stick with the A380 or bail out and order planes from archrival Boeing (Charts) instead. 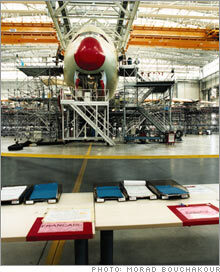 An A380 gets its wings at the Airbus plant in Toulouse, France. The factory is operating at 25 percent of capacity. 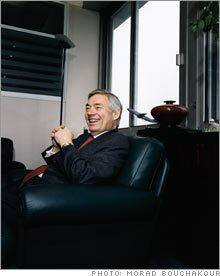 Airbus's top salesman, John Leahy, has the difficult job of renegotiating contracts and keeping customers from running for the exits. "Toulouse Goose" That's what some customers have taken to calling the jinxed plane, seen here in profile at Airbus's assembly plant in France. FedEx (Charts) has already done just that, stunning Airbus in November by canceling a $3 billion order for ten planes and striking a $3.5 billion deal with Boeing for ten new 777s. The blow was the latest in a series of setbacks for the audacious $14 billion project to launch a 555-passenger aircraft - setbacks that have caused the once-highflying company to lose its lead over Boeing. Now, even as Airbus engineers in France and Germany race to sort out the wiring problems that sparked the delays (see what went wrong), Airbus co-chief commercial officer John Leahy is waging just as critical a battle. His mission: Stop other A380 customers from heading for the exits, while selling the still-on-the-drawing-board A350 and making sure orders for narrow-body planes like the A320 don't dry up. Maybe it's no coincidence that days before FedEx canceled, Leahy, New York-born but based in Toulouse, France, checked into the Mayo Clinic for emergency heart surgery. "The key thing is that the customers stay onboard," says Leahy, 56, sitting in his Toulouse office on a foggy morning in January just before heading to the airport for a flight to the U.S. Fully recovered from his operation and back to the globetrotting ways that have made him a legendary salesman in the aviation world, Leahy says, "I anticipate no further delays at this point. There's enough fat built in now." Even if he's right - and several customers have told Fortune they are dubious - there's also the matter of hundreds of millions of dollars in penalties Airbus is liable for because of the delays, which pushed deliveries from 2007 to 2010 and beyond for all but a handful of airlines. Although they're entitled to cash compensation, Leahy is trying to persuade customers to accept discounts on future orders instead. "You're always better off with credits on future business than you are writing a check," he says. That's especially true because shares of Airbus's parent, the pan-European consortium known as EADS, have nosedived 21 percent in the past year, hammered by the disclosure that the A380 debacle would reduce earnings by $6 billion over the next four years. The delays in what industry insiders have nicknamed the "Toulouse Goose" - a nod to Howard Hughes's ill-fated "Spruce Goose" - have also enabled Boeing to overtake Airbus in total plane orders for the first time since 2000. "Boeing is a good competitor," says Leahy, "but Airbus shot itself in both feet with one bullet." Meanwhile the turmoil rippled through Airbus headquarters, forcing Christian Streiff to quit his job as CEO in October after just three months on the job. Streiff was replaced by EADS co-CEO Louis Gallois, who has been on the road visiting customers with Leahy. But for at least one buyer it was already too late. "There were conversations at the highest levels," says FedEx spokesman Maury Lane, describing the long negotiations, which culminated in the visit of a team of Airbus salesmen to Memphis one weekend last fall. "First it was late 2008 or early 2009, then it was 2010 or 2011. The dates were never certain, and that was the problem." Now Fed Ex and Airbus are negotiating over penalty payments, which industry sources say could reach $100 million. For Leahy and Gallois the coming weeks will be critical. In mid-February they cut a deal with Thai Airways, offering discounts of more than $10 million a plane on eight midsized jets in exchange for sticking with an order of six A380s. But Emirates and UPS (Charts), among others, are still negotiating.